Sometimes it can be hard to figure out what to put on your registry, your traditional Aunt might want to give you china, that you don't even want. Your grandma may want to give you a fancy silver platter. It's all so confusing, and there are so many options. I think it's awesome that we now have the ability to ask for what we really want with sites like myregistry.com, where you can add items from anywhere on the internet, Etsy to Target. Here are five adorable, unnecessary, personalized item ideas to confuse you further. This customized art print from Rifle Paper Co. would be so charming hung in your kitchen or on any gallery wall. I gifted one of these cutting boards by AHeirloom, for a small cost you can add initials and a heart to take the personalization a step further. All states and some countries and cities also available. 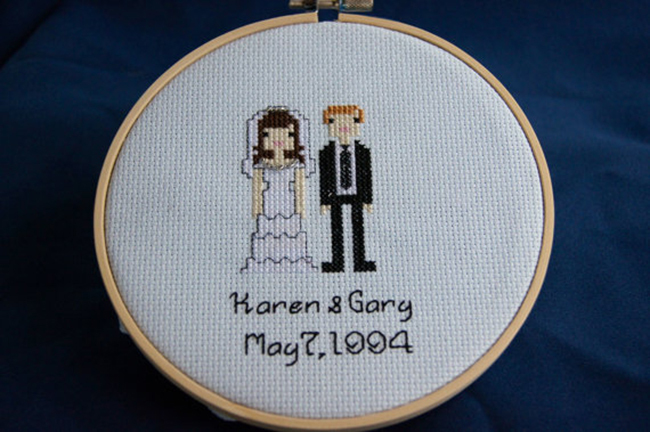 Another Etsy gem I found and have gifted is this charming cross-stitch couple by Sea Of Dream Crafts. This gift is something I would have loved to add to my registry, a custom honeymoon map. This one by LindseyBee is an amazing keepsake of all your honeymoon memories. and finally what bar is complete without a fancy copper tray? You can find this and lots more personalized gift ideas at Mark & Graham.